In 1965 this stained glass panel was discovered behind plaster in No 2, Canon’s Cloister. It depicts an armoured St George standing on a flower strewn mound and spearing the dragon through the mouth. The detail in the panel, which measures 48 x 30 cm, is quite remarkable and certainly merits close examination. The plaster which covered and preserved the panel probably dated from the 1640s. The glass was almost perfectly intact, with only part of the dragon missing. Upon its discovery, the panel was mounted in a seventeenth century casement and moved to the Aerary to be stored with the archives. In 1977 the Society of Friends and Descendants offered to pay for the panel to be restored and inserted into the west window of the Deanery Chapel. The Cathedral Studios at Canterbury took on the task of restoring the panel to its former glory and it was installed in its new home in the early 1980s. Today the panel can be seen both from inside the Deanery Chapel and from the Dean’s Cloister. When it comes to dating the panel, it is possible to examine both the style employed and the apparel of St George. The purity and distinction of the figure of St George is characteristic of work in the international style of the fifteenth century. The style of St George’s plate armour suggests that the glass was painted in the early Lancastrian period (1399-1471). As the home of the Order of the Garter and of English chivalry, the figure of the patron saint displayed at Windsor may have been expected to wear fully contemporary armour. Consequently, we can estimate the date of the panel as being in the first quarter of the fifteenth century, at the height of the French wars. This makes it one of the earliest surviving examples of stained glass in the College. This blogpost marks the end of this series on the St Georges of St George’s. 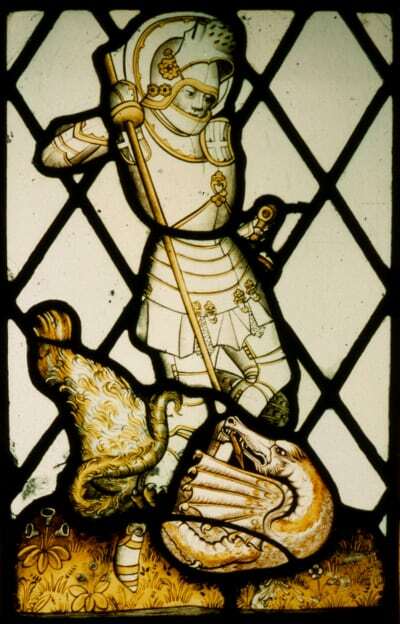 Of course, the depictions of St George that we have examined over the past few weeks are by no means exhaustive. In the Chapel Archives alone, he appears hundreds of times, impressed in wax on the College Seal (find out more). So next time you visit the College, be sure to keep your eyes peeled for other images of this dragon-slaying martyr.